“We moved my elderly father into our home about 18 months ago. His home finally sold last fall and to celebrate he offered to buy us a new heating and cooling system. He said he’d do it if we promised to keep it warmer in here than we did last winter! Of course, I’m getting to that age where I like it pretty toasty too, so we agreed and are very appreciative. Up to 15.5 SEER for cooling and up to 8.6 HSPF for heating, Energy Star qualified. Highest efficiencies achieved when installed as part of a complete Carrier Comfort system. Single-stage scroll compressor for excellent economy. Compressor sound-blanket and other noise reduction features produce 70db operation. Supports Thermidistat controller for better dehumidification when cooling. Hybrid Heat compatible with a matching Carrier Comfort gas furnace. Steel-louvered cabinet protects internal components. Uses Puron instead of refrigerants that may damage the environment. Baked on powder paint for long life and quality appearance. 10-year limited warranty when registered properly and installed by a professional. 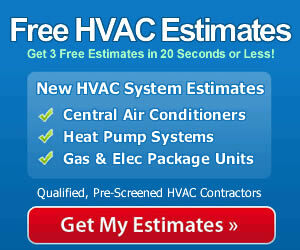 While in a tough economy we all want to cut costs where we can, skimping on HVAC installation may cost you in the end. Improperly installed units may not function at peak performance or worse, they may present danger from wiring fires or in the case of gas furnaces, gas or carbon monoxide leaks. Having a qualified contractor install your system will ensure safe, dependable and efficient operation. When getting HVAC prices, research more than just the cost. Find out what you can about the contractor and consider their experience and reputation just as seriously as you consider the heat pump prices they quote you.